Why do we forget? There are two simple answers to this question. First, the memory has disappeared - it is no longer available. Second, the memory is still stored in the memory system but, for some reason, it cannot be retrieved. These two answers summaries the main theories of forgetting developed by psychologists. The first answer is more likely to be applied to forgetting in short term memory, the second to forgetting in long term memory. Forgetting information from short term memory (STM) can be explained using the theories of trace decay and displacement. Forgetting from long term memory (LTM) can be explained using the theories of interference, retrieval failure and lack of consolidation. This explanation of forgetting in short term memory assumes that memories leave a trace in the brain. A trace is some form of physical and/or chemical change in the nervous system. Trace decay theory states that forgetting occurs as a result of the automatic decay or fading of the memory trace. Trace decay theory focuses on time and the limited duration of short term memory. This theory suggests short term memory can only hold information for between 15 and 30 seconds unless it is rehearsed. After this time the information / trace decays and fades away. No one disputes the fact that memory tends to get worse the longer the delay between learning and recall, but there is disagreement about the explanation for this effect. According to the trace decay theory of forgetting, the events between learning and recall have no affect whatsoever on recall. It is the length of time the information has to be retained that is important. The longer the time, the more the memory trace decays and as a consequence more information is forgotten. There are a number of methodological problems confronting researchers trying to investigate the trace decay theory. One of the major problems is controlling for the events that occur between learning and recall. Clearly, in any real-life situation, the time between learning something and recalling it will be filled with all kinds of different events. This makes it very difficult to be sure that any forgetting which takes place is the result of decay rather than a consequence of the intervening events. Support for the idea that forgetting from short-term memory might be the result of decay over time came from research carried out by Brown (1958) in the United Kingdom, and Peterson and Peterson (1959) in the United States. The technique they developed has become known as the Brown-Peterson task. There is very little direct support for decay theory as an explanation for the loss of information from short-term and long-term memory. One of the problems with decay theory is that it is more or less impossible to test it. In practice, it is not possible to create a situation in which there is a blank period of time between presentation of material and recall. Having presented information participants will rehearse it. If you prevent rehearsal by introducing a distracter task, it results in interference. Decay theory has difficulty explaining the observation that many people can remember events that happened several years previously with great clarity, even though they haven't thought about them during the intervening period. If our memories gradually decayed over time, then people should not have clear memories of distant events which have lain dormant for several years. However, there is evidence to suggest that information is lost from sensory memory through the process of decay (Sperling, 1960). Displacement seeks to explain forgetting in short term memory, and suggests it’s due to a lack of availability. Displacement theory provides a very simple explanation of forgetting. Because of its limited capacity, suggested by Miller to be 7+/- 2 items, STM can only hold small amounts of information. When STM is 'full', new information displaces or 'pushes out’ old information and takes its place. The old information which is displaced is forgotten in STM. It was also assumed that the information that had been in the short-term store for the longest was the first to be displaced by new information, similar to the way in which boxes might fail off the end of a conveyor belt - as new boxes are put on one end, the boxes which have been on the conveyor belt the longest drop off the end. Support for the view that displacement was responsible for the loss of information from short-term memory came from studies using the 'free-recall' method. A typical study would use the following procedure: participants listen to a list of words read out a steady rate, usually two seconds per word; they are then asked to recall as many of words as possible. They are free to recall the words in any order, hence the term 'free recall'. The findings from studies using free recall are fairly reliable and they produce similar results on each occasion. If you take each item in the list and calculate the probability of participants recalling it (by averaging recall of the word over all participants) and plot this against the item's position in the list, it results in the serial position curve (Figure 1). Good recall of items at the beginning of the list is referred to as the primacy effect and good recall if items at the end of the list are referred to as the recency effect. The displacement theory of forgetting from short-term memory can explain the recency effect quite easily. The last few words that were presented in the list have not yet been displaced from short-term memory and so are available for recall. The primacy effect can be explained using Atkinson & Shiffrin's (1968) multi-store model which proposes that information is transferred into long-term memory by means of rehearsal. The first words in the list are rehearsed more frequently because at the time they are presented they do not have to compete with other words for the limited capacity of the short-term store. This means that words early in the list are more likely to be transferred to long-term memory. 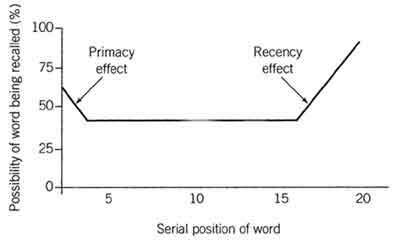 So the primacy effect reflects items that are available for recall from long-term memory. However, words in the middle of the list used to be in short term memory until they were pushed out - or displaced by the words at the end of the list. Displacement theory provided a good account of how forgetting might take place in Atkinson & Shiffrin's (1968) model of short-term memory. However, it became clear that the short-term memory store is much more complex than proposed in Atkinson and Shiffrin's model (re: working memory). Murdock’s (1962) serial position experiment supports the idea of forgetting due to displacement from short term memory, although it could be due to decay. Forgetting from short term memory can occur due to displacement or due to decay, but it is often very difficult to tell which one it is. If you had asked psychologists during the 1930s, 1940s, or 1950s what caused forgetting you would probably have received the answer "Interference". It was assumed that memory can be disrupted or interfered with by what we have previously learned or by what we will learn in the future. This idea suggests that information in long term memory may become confused or combined with other information during encoding thus distorting or disrupting memories. 1. Proactive interference (pro=forward) occurs when you cannot learn a new task because of an old task that had been learnt. When what we already know interferes with what we are currently learning  where old memories disrupt new memories. 2. Retroactive interference (retro=backward) occurs when you forget a previously learnt task due to the learning of a new task. In other words, later learning interferes with earlier learning - where new memories disrupt old memories. Proactive and retroactive Interference is thought to be more likely to occur where the memories are similar, for example: confusing old and new telephone numbers. Chandler (1989) stated that students who study similar subjects at the same time often experience interference. Previous learning can sometimes interfere with new learning (e.g. difficulties we have with foreign currency when travelling abroad). Also new learning can sometimes cause confusion with previous learning. (Starting French may affect our memory of previously learned Spanish vocabulary). Aim: To investigate how retroactive interference affects learning. In other words, to investigate whether information you have recently received interferes with the ability to recall something you learned earlier. Method: A lab experiment was used. Participants were split into two groups. Both groups had to remember a list of paired words  e.g. cat - tree, jelly - moss, book - tractor. The experimental group also had to learn another list of words where the second paired word if different  e.g. cat  glass, jelly- time, book  revolver. The control group were not given the second list. All participants were asked to recall the words on the first list. Results: The recall of the control group was more accurate than that of the experimental group. Conclusion: This suggests that learning items in the second list interfered with participants’ ability to recall the list. This is an example of retroactive interference. Although proactive and retroactive interference are reliable and robust effects, there are a number of problems with interference theory as an explanation of forgetting. First, interference theory tells us little about the cognitive processes involved in forgetting. Secondly, the majority of research into the role of interference in forgetting has been carried out in a laboratory using lists of words, a situation which is likely to occur fairly infrequently in everyday life (i.e. low ecological validity). As a result, it may not be possible to generalize from the findings. Baddeley (1990) states that the tasks given to subjects are too close to each other and, in real life; these kinds of events are more spaced out. Nevertheless, recent research has attempted to address this by investigating 'real-life' events and has provided support for interference theory. However, there is no doubt that interference plays a role in forgetting, but how much forgetting can be attributed to interference remains unclear (Anderson, 2000). Some permanent alteration of the brain substrate in order to represent some aspect of a past experience'. When we take in new information, a certain amount of time is necessary for changes to the nervous system to take place  the consolidation process  so that it is properly recorded. During this period information is moved from short term memory to the more permanent long term memory. The brain consists of a vast number of cells called neurons, connected to each other by synapses. Synapses enable chemicals to be passed from one neuron to another. These chemicals, called neurotransmitters, can either inhibit or stimulate the performance of neurons. So if you can imagine a network of neurons all connected via synapses, there will be a pattern of stimulation and inhibition. It has been suggested that this pattern of inhibition and stimulation can be used as a basis for storing information. This process of modifying neurons in order form new permanent memories is referred to as consolidation (Parkin, 1993). There is evidence that the consolidation process is impaired if there is damage to the hippocampus (a region of the brain). In 1953, HM had brain surgery to treat his epilepsy, which had become extremely severe. The surgery removed parts of his brain and destroyed the hippocampus, and although it relieved his epilepsy, it left him with a range of memory problems. Although his STM functioned well, he was unable to process information into LTM. The main problem experienced by HM is his inability to remember and learn new things. This inability to form new memories is referred to as anterograde amnesia. However, of interest in our understanding of the duration of the process of consolidation is HM's memory for events before his surgery. In general, his memory for events before the surgery remains intact, but he does have some memory loss for events which occurred in the two years leading up to surgery. Pinel (1993) suggests that this challenges Hebb's (1949) idea that the process of consolidation takes approximately 30 minutes. The fact that HM's memory is disrupted for the two-year period leading up to the surgery indicates that the process of consolidation continues for a number of years. Finally, aging can also impair our ability to consolidate information. The research into the processes involved in consolidation reminds us that memory relies on biological processes, although the exact manner by which neurons are altered during the formation of new memories has not yet been fully explained. However, there is no doubt that investigating the role of neurons and neurotransmitters will provide new and important insights into memory and forgetting. Retrieval failure is where the information is in long term memory, but cannot be accessed. Such information is said to be available (i.e. it is still stored) but not accessible (i.e. it cannot be retrieved). It cannot be accessed because the retrieval cues are not present. External / Context - in the environment, e.g. smell, place etc. Internal / State- inside of us, e.g. physical, emotional, mood, drunk etc. There is considerable evidence that information is more likely to be retrieved from long-term memory if appropriate retrieval cues are present. This evidence comes from both laboratory experiments and everyday experience. A retrieval cue is a hint or clue that can help retrieval. Tulving (1974) argued that information would be more readily retrieved if the cues present when the information was encoded were also present when its retrieval is required. For example, if you proposed to your partner when a certain song was playing on the radio, you will be more likely to remember the details of the proposal when you hear the same song again. The song is a retrieval cue - it was present when the information was encoded and retrieved. Tulving suggested that information about the physical surroundings (external context) and about the physical or psychological state of the learner (internal context) is stored at the same time as information is learned. Reinstating the state or context makes recall easier by providing relevant information, while retrieval failure occurs when appropriate cues are not present. For example, when we are in a different context (i.e. situation) or state. Retrieval cues may be based on context-the setting or situation in which information is encoded and retrieved. Examples include a particular room, driving along a motorway, a certain group of people, a rainy day and so on. Context also refers to the way information is presented. For example, words may be printed, spoken or sung, they may be presented in meaningful groups - in categories such as lists of animals or furniture - or as a random collection without any link between them. Evidence indicates that retrieval is more likely when the context at encoding matches the context at retrieval. You may have experienced the effect of context on memory if you have ever visited a place where you once lived (or an old school). Often such as visit helps people recall lots of experiences about the time they spent there which they did not realize were stored in their memory. A number of experiments have indicated the importance of context-based cues for retrieval. An experiment conducted by Tulving and Pearlstone (1966) asked participants to learn lists of words belonging to different categories, for example names of animals, clothing and sports. Participants were then asked to recall the words. Those who were given the category names recalled substantially more words than those who were not. The categories provided a context, and naming the categories provided retrieval cues. Tulving and Pearlstone argued that cue-dependent forgetting explains the difference between the two groups of participants. Those who recalled fewer words lacked appropriate retrieval cues. An interesting experiment conducted by Baddeley (1975) indicates the importance of setting for retrieval. Baddeley (1975) asked deep-sea divers to memorize a list of words. One group did this on the beach and the other group underwater. When they were asked to remember the words half of the beach learners remained on the beach, the rest had to recall underwater. Half of the underwater group remained there and the others had to recall on the beach. The results show that those who had recalled in the same environment (i.e. context) which that had learned recalled 40% more words than those recalling in a different environment. This suggests that the retrieval of information is improved if it occurs in the context in which it was learned. The basic idea behind state-dependent retrieval is that memory will be best when a person's physical or psychological state is similar at encoding and retrieval. For example, if someone tells you a joke on Saturday night after a few drinks, you'll be more likely to remember it when you're in a similar state - at a later date after a few more drinks. Stone cold sober on Monday morning, you'll be more likely to forget the joke. State retrieval clues may be based on state-the physical or psychological state of the person when information is encoded and retrieved. For example, a person may be alert, tired, happy, sad, drunk or sober when the information was encoded. They will be more likely to retrieve the information when they are in a similar state. Tulving and Pearlstone’s (1966) study involved external cues (e.g. presenting category names). However, cue-dependent forgetting has also been shown with internal cues (e.g. mood state). Information about current mood state is often stored in the memory trace, and there is more forgetting if the mood state at the time of retrieval is different. The notion that there should be less forgetting when the mood state at learning and at retrieval is the same is generally known as mood-state-dependent memory. A study by Goodwin et al. (1969) investigated the effect of alcohol on state-dependent retrieval. They found that when people encoded information when drunk, they were more likely to recall it in the same state. For example, when they hid money and alcohol when drunk, they were unlikely to find them when sober. However, when they were drunk again, they often discovered the hiding place. Other studies found similar state-dependent effects when participants were given drugs such as marijuana. People tend to remember material better when there is a match between their mood at learning and at retrieval. The effects are stronger when the participants are in a positive mood than a negative mood. They are also greater when people try to remember events having personal relevance. According to retrieval-failure theory, forgetting occurs when information is available in LTM but is not accessible. Accessibility depends in large part on retrieval cues. Forgetting is greatest when context and state are very different at encoding and retrieval. In this situation, retrieval cues are absent and the likely result is cue-dependent forgetting. There is considerable evidence to support this theory of forgetting from laboratory experiments. The ecological validity of these experiments can be questioned, but their findings are supported by evidence from outside the laboratory. For example, many people say they can't remember much about their childhood or their school days. But returning to the house in which they spent their childhood or attending a school reunion often provides retrieval cues which trigger a flood of memories. Atkinson, R. C., & Shiffrin, R. M. (1968). "Chapter: Human memory: A proposed system and its control processes". In Spence, K. W., & Spence, J. T. The psychology of learning and motivation (Volume 2). New York: Academic Press. pp. 89–195. Baddeley, A.D. (1997). Human memory: Theory and Practice (Revised Edition). Hove: Psychology Press. Baddeley, A.D. (1990). Human Memory: Theory and Practice. London: Lawrence Erlbaum Associates. Baddeley, A. D., & Logie, R. H. (1999). Working memory: The multiple-component model. In A.Miyake & P. Shah (Eds. ),Models of working memory(pp. 28±61). Cambridge, UK: Cambridge University Press. Brown, John (1958). Some Tests of the Decay Theory of Immediate Memory. Quarterly Journal of Experimental Psychology, 10, 12-21. Godden, D. R., & Baddeley, A. D. (1975). Context-dependent memory in two natural environments: On land and underwater. British Journal of Psychology, 66(3), 325-331. Goodwin, D. W., Crane, J. B., & Guze, S. B. (1969). Alcoholic “blackouts”: a review and clinical study of 100 alcoholics. American Journal of Psychiatry, 126(2), 191-198. Hebb, D. O. (1949). Organizations of Behavior. New York: Wiley. Murdock, Bennet B. (1962). The serial position effect of free recall. Journal of Experimental Psychology, 64(5),482–488. Parkin, A. (1993). Memory: Phenomena, Experiment and Theory. Psychology Press Ltd.
Pinel, J. P. J. (1993). Biopsychology. Boston: Allyn and Bacon. Sperling, G. (1960). Negative afterimage without prior positive image. Science, 131, 1613-1614. Tulving, E. and Pearlstone, Z. (1966). Availability versus accessibility of information in memory for words. Journal of Verbal Learning & Verbal Behavior, 5(4), 381-391. Tulving, E. (1974). Cue-dependent forgetting. American Scientist, 62, 74-82.